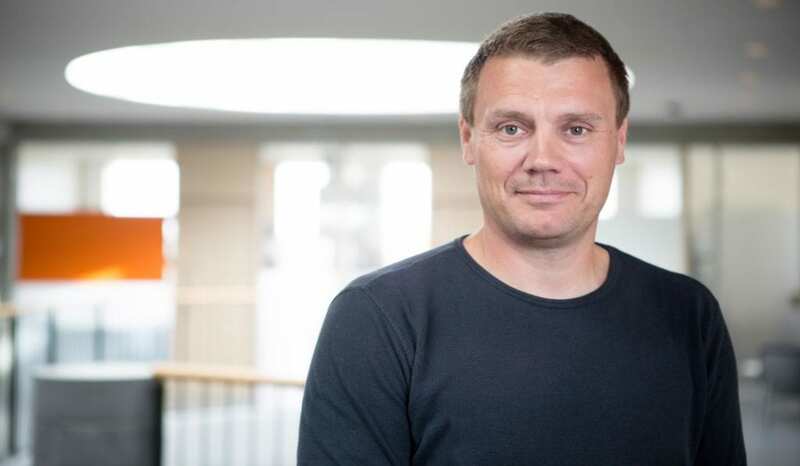 Klavs Martin Sorensen is an associate professor in the Department of Food Science at the University of Copenhagen (UCPH FOOD), in the Chemometrics and Analytical Technology section, where he researches rapid methods that can optimise food production. ‘As a researcher, it is very rewarding to work with research and innovation that prevent the waste of raw materials, as the lack of resources is one of the biggest problems the world is facing right now,’ says Sorensen, who feels honoured to be the recipient of this year’s Nils Foss Talent Prize. ‘It is fantastic to receive a prize given in Nils Foss’ name. He was an entrepreneur and a visionary to a degree that one can only aspire to. It is a great acknowledgement that the work I’m doing is on the right track and is relevant for the food industry,’ continues Sorensen, who received 15,000 euros and a work of art at the awards ceremony. Of the projects that Sorensen is currently working on, one is looking at reusing water in dairies, to make it part of a circular system. ‘We are working to move near-infrared spectroscopy to the field in the industry and are measuring water quality at Arla, where, in collaboration with the Department of Computer Science at the University of Copenhagen, we are using artificial intelligence to predict water quality. It is an interesting constellation, as we are taking methods from the university’s laboratories and applying them out in the real world, where data never behaves quite as you expect it to,’ Sorensen explains. Another research project is examining the factors that influence the quality of cheese. Dairies typically produce a batch of cheese and then take a sample to describe the entire batch, but, because raw materials are different, there may be quite large variations within a batch. In this project, the researchers are measuring the quality of all of the cheeses in a batch using a near-infrared measurement technique that is built into a robotic arm. ‘Using artificial intelligence and machine learning techniques, the robotic arm takes a chemical “fingerprint” of the new cheeses to predict the final quality after three months of maturation. This is a major shift, as you go from getting a “snapshot” of a single cheese in a batch to knowing the quality of all of the cheeses. This allows you to catch any defects while the development of the cheeses can still be corrected, thus avoiding poor quality and waste,’ says Sorensen. The measurements also map the conditions that can change the quality, including, for example, the seasonal variation of milk, the breed of the cow, whether the milk is organic, etc. The measurements produce data on how the dairy can optimise its process technical parameters, too. Before Sorensen earned his PhD in 2015, he was employed in the food industry for many years, and this has given him a unique understanding of what is needed to make research work in large-scale food production. One of the solutions he was the driving force behind currently functions as a de facto standard in the world’s largest slaughterhouses. It is an ultrasound scanner that makes a three-dimensional scan of how the muscles and back fat are distributed on a pig. By interpreting the scan using advanced mathematical methods (chemometry), you can, for example, determine how much meat there is on a given pig and the best cuts to use it for. The measurements are done in a split second, while the pig carcasses move across a production line, meaning that the slaughterhouses can use each pig optimally. ‘One of the things I enjoy most is getting an idea and carrying it through to a finished device; to have a picture of something in my head and then be able to realise it,’ says Sorensen, who now got a faithful helper. ‘We recently got a 3D printer in the Chemometrics and Analytical Technology section at UCPH FOOD, which means that I can wake up in the morning with a picture of something in my head that I can draw in my CAD program and turn into a 3D print. This allows me to quickly test ideas, which usually there are many of, before I arrive at something that can really be used in large-scale food production. The 3D printer makes it possible to quickly flesh out an idea, gain experience and improve it, and it is this process that I love most about my job,’ Sorensen concludes.